Definition at line 12 of file CQEffectDescriptionEdit.h. Definition at line 15 of file CQEffectDescriptionEdit.cpp. Definition at line 22 of file CQEffectDescriptionEdit.cpp. Definition at line 47 of file CQEffectDescriptionEdit.cpp. References CQEffectDescription::Colorize, CQEffectDescription::DropShadow, CQEffectDescription::getCN(), CQEffectDescription::getEndColor(), CQEffectDescription::getMode(), CQEffectDescription::getScaleEnd(), CQEffectDescription::getScaleStart(), CQEffectDescription::getStartColor(), CQEffectDescription::Scale, and setColor(). 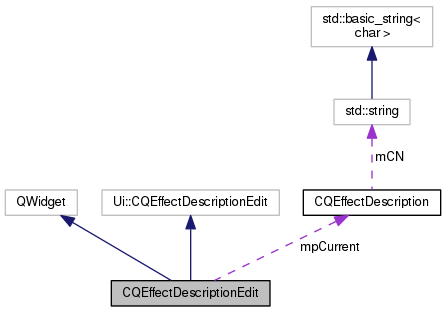 Definition at line 77 of file CQEffectDescriptionEdit.cpp. References CQEffectDescription::Colorize, CQEffectDescription::DropShadow, CQEffectDescription::Scale, CQEffectDescription::setEndColor(), CQEffectDescription::setMode(), CQEffectDescription::setScaleEnd(), CQEffectDescription::setScaleStart(), and CQEffectDescription::setStartColor(). Definition at line 111 of file CQEffectDescriptionEdit.cpp. Definition at line 115 of file CQEffectDescriptionEdit.cpp. Definition at line 119 of file CQEffectDescriptionEdit.cpp. Definition at line 127 of file CQEffectDescriptionEdit.cpp. Definition at line 132 of file CQEffectDescriptionEdit.cpp. Definition at line 123 of file CQEffectDescriptionEdit.cpp. Definition at line 92 of file CQEffectDescriptionEdit.cpp. Definition at line 30 of file CQEffectDescriptionEdit.h.